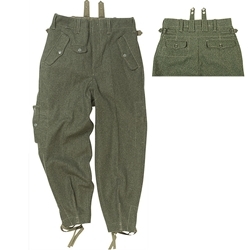 German M38 Fallschirmjäger Trousers WWII Reproductons are high quality German Paratrooper Pants made from the correct weight and color field gray wool. These Fallschirmjager Trousers feature: Side Waist Adjustment straps and buckles, Belt Loops, Two Side Pockets, Watch Pocket and Two Rear Pockets, Gravity Knife Pockets and knee pad openings all with heavy duty snap closure flaps. These German Paratrooper Pants have Tapered Ankles with Twill Tape Stirrups and all are made in authentic sizes. Our M38 Fallschirmjäger Trousers, made for wear and tear are great for display or re-enactments.